by Joe Lombardi on LaxLessons.com’s Lacrosse Insider premium coverage section. Kevin Cutinella has an unconventional skill set for a midfielder. The sophomore at Suffolk County (NY) power Shoreham-Wading River is as comfortable feeding as he is finishing. He also is a powerful dodger and strong defender. It’s that combination of attributes that attracted interest from a variety of Division I programs. 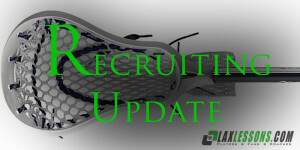 Earlier this week, he decided where he will be playing at the next level, giving a commitment to UMass, a decision first reported when it was made by Joe Lombardi on LaxLessons.com’s Lacrosse Insider premium coverage section. Now, here’s a Q&A with Kevin on his commitment. As soon as I stepped onto campus and met with (UMass Assistant) Coach (Brian) Jacovina and (Head) Coach (Greg) Cannella, I felt that UMass is where I belong. Having great academics and great lacrosse, I felt that I made a perfect decision that’s the perfect fit for me. Binghamton, Vermont, Stony Brook, Sacred Heart, St. Joseph, Boston University and Towson. My style of play is unique because I have the ability to score from all spots on the field with multiple types of dodges, as well as the ability to feed. I also have the ability to play strong defense. I have to work at speed, agility and stickwork to maintain the my style of play. I’ve been playing since first grade and fell in love with it right when I picked up a stick. I currently play football and basketball as well as lacrosse. Long Island Outlaws 2017 Select Team. Philly Showcase, Quakerfest and Adrenaline Fall Invitational. I would like to thanks my parents for being there for me and supporting me throughout my recruiting. Also, I would like to thank Coach Mike Brennan and Coach John Rowan whom helped me, guided me, and coached me on the Outlaws. Thanks to Mr. Betcher and Coach Mike Taylor for guiding me as well.